I always enjoyed the Shining Force games for the Genesis. I remember controlling many different types of characters in a series of battles, choosing which characters would be in your party, buying new weapons for them at the stores, searching for the blacksmith that will make special weapons, and so on. I also remember the one aspect I didn't like about the games, which were its extremely cartoonish graphics, filled with bright colors. With that in mind, after I played Shining Force III for a little while, I had two predominant feelings: It was like going back into an old, comfortable shoe, and it finally overcame the main problem I had with the Shining Force series. I always read the manual before I play a video game, especially an RPG. After I read Shining Force III's manual, however, I realized I didn't need to. 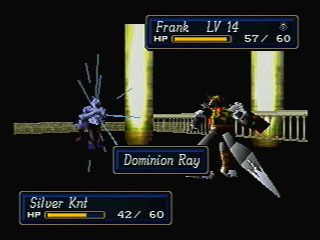 The interface, the objects, and the names of previous Shining Force games were all present in this new game, with the only difference of them being in rendered 3d graphics. Navigating though the menus was very easy for people like me who played the previous games. The only exception was using special magic objects, which was confusing at first. I normally am very skeptical when a 2d game is turned into a 3d game. I believe 2d art is much more detailed and beautiful than 3d art, even though 3d art gives you the flexibility of different points of view. 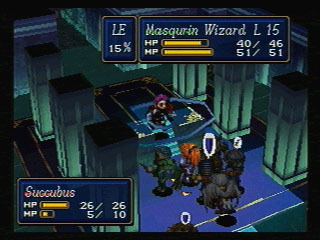 When I saw Shining Force III, however, I felt this is how this game was supposed to be from the beginning! Of course, the Genesis could not handle these graphics. Although the characters were still super deformed, they were not as much so as in previous games, plus you could change the angle when you walked around the towns as you pleased. No more prerendered backgrounds, as in Final Fantasy VII, where you often didn't know where to go. Plus the colors were much more appealing than on the previous Shining Forces. My most pleasant surprise, however, was when the first battle started (after I was teased with a battle which did not take place). When a character actually attacks, and you see the action from up close, the characters were in 3d, their joints moved, and at a fast pace! On previous games of the series, all you saw were sprites that looked like pieces of paper since they didn't animate, on top of a background which also looked like a piece of paper. You saw the same messages on the screen as in the previous games, indicating points of damage, experience, and so on, but it seemed almost like an entirely new experience. I didn't feel like playing the previous games again. The game also features many hidden features which made the game more fun. Throughout the game you find several ruins, which you can explore for treasures you could not find anywhere else. It is not as easy as it seems, though, since when you enter the ruins thieves also enter, searching for the same treasures you do. And they always move faster than you. In other cases there are doors blocked by obstacles, like barrels. You can only break the barrels in the middle of a battle. If you win the battle and haven't done so, you cannot open the doors and get to the treasure chests beneath them. The plot was reasonably good, which involves rescuing the emperor who has been kidnapped, but it is not great. The plot in part two was much better. In part two you follow a kingdom as it is destroyed, and its inhabitants have to travel and settle in another land. Plus you see the emotions of the gods and the demons, and their struggle with each other. 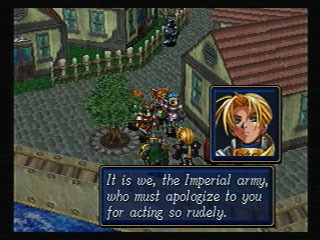 This is the only aspect which was better on a previous Shining Force. 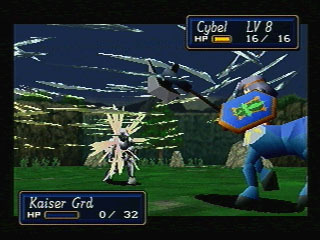 Throughout the game you get a lot of variety as you battle. You battle in towns, forests, waterfalls, bridges, haunted houses, caves, and more. Plus the battlefields are also in 3d and let you change the camera angle. You don't really get bored during the game; only frustrated, since you die several times. It really only affects your ego, though, because you can start the battle again without loosing levels or experience points. Previous Shining Force games had that same feature. All this was spoiled when I reached the end, though. When the game was over I felt there were several loose ends which were not taken care of. For example, what happened to Julian after he fell into the river? Did he live or die? We also saw a crystal that glew brighter as war went on. This was never mentioned again. There was also a demon which was supposed to be awakened, as in previous Shining Forces. It never was. All these plot elements were supposed to be solved during the other two scenarios, but they were never brought to the U.S. This makes the experience feel incomplete. Really, if Sega was going to release just one more RPG, it would've been better for the consumers to release Grandia, since it was a complete game in itself. They didn't because with Shining Force III they wouldn't have to pay a licence. What Sega ended up doing was to just give us a taste of what could've been if they wouldn't have killed the Saturn with bad marketing.